This extra large punched tin star light with colored glass creates a multi-colored glow in any room, entrance way or patio. 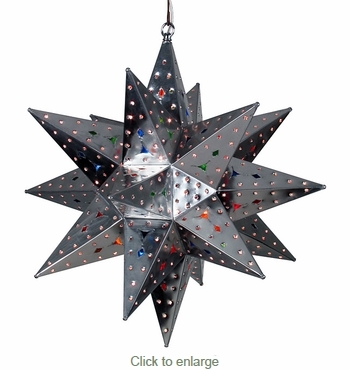 This large Moravian hanging star light was carefully hand crafted by artisans in Mexico. All hand punched and assembled with many pieces of colored glass inserts inside each star point. This natural tin and glass star light chandelier will enhance any Spanish colonial, southwest or Mexican decor. Since each star lamp is hand crafted, color and finish may vary slightly from what's pictured here. Chain and ceiling plates sold separately. $9.95 Small Natural Tin Ceiling Plate 5" Dia. Large Natural Tin Ceiling Plate 6" Dia. $10.45 Large Natural Tin Ridged Ceiling Plate 6" Dia.